DeArmond officially introduced the world’s first musical instrument electrical effect unit, the Model 60 tremolo pedal, in their 1946 Green leaflet. However, this item was advertised in Epiphone’s Electar catalog in 1941. Over the next 35 years, a wide range of effects units was designed and manufactured, as shown below. The housings that DeArmond designed and produced for their own products were also used by other manufacturers of effects units, including some of the Maestro range of pedals by Gibson, and other pedal products by ADT, Foxx, Lexicon, PAIA, Moog, Oberheim and Regal. Examples of some of these pedals are shown in the section entitled ‘Non-deArmond products’ on this site. The range of tremolo pedals below, including the Model 60, Model 60A, Model 60B, Model 800 and Model 800-A all operate on the same basis – a mains voltage motor rocks a small sealed bottle fitted with two electrical contacts and containing electrically conductive fluid. 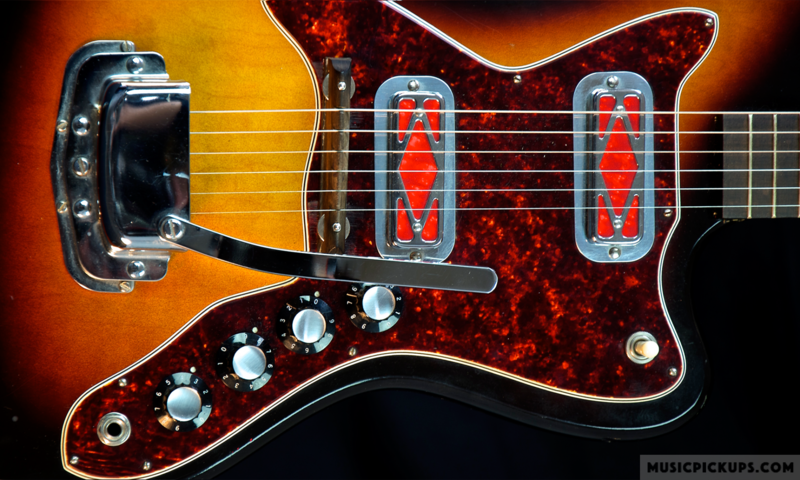 The variable frequency of the ‘make and break’ action of the mechanism creates a type of tremolo effect. Model 1620 is a dual channel passive volume controller with two input and two output jacks. Model 1622 is a passive stereo volume controller with two input and two output jacks. Model 610 is a single-channel basic passive volume volume and tone controller. Volume is adjusted by up/down movement of the treadle and tone is adjusted by left/right movement of the treadle. Models 1604, 1700, 1800, 1802 Weeper, 1802 Weeper Wah Wah, 1850, 1900, 1920 and 1930 each require a 9 Volt PP3 battery. Model 600 Volume control pedal. Model 610 Combination volume & tone control pedal. Model 1630 Opto-volume pedal, requires 110V 60Hz electrical supply. Model 1650 Pan volume stereo pedal. Model 1700 Square Wave distortion pedal, requires integral 9V battery driving a printed circuit-board. Model 1800 Wa-Wa pedal combination volume, requires integral 9V battery driving a printed circuit-board. Model 1802 Weeper pedal, requires integral 9V battery driving a printed circuit-board. Model 1850, Thunderbolt pedal, requires integral 9V battery driving a printed circuit-board. Model TFS-100 Footswitch, supplied as Tremolo ON/Off switch with all appropriate DeArmond and CF Martin tube amps.